NASA chief Charlie Bolden will roll out the space agency's next budget Monday (Feb. 13) in a room full of reporters — and some of the agency's die-hard Twitter fans. The space agency has invited 20 of its so-called "tweeps" to Monday's press conference at NASA headquarters in Washington, D.C., where Bolden will discuss NASA's proposed budget for fiscal year 2013. The lucky 20 were chosen by lottery today (Feb. 10), following a 24-hour online registration window that closed Thursday afternoon. Monday's "tweetup" is part of a sustained effort by NASA to reach out to its fans via social media. The space agency held its first tweetup in January 2009, and since then NASA Twitter followers have attended many launches, behind-the-scenes tours and other events. Last February, for example, about 100 tweeps descended on NASA's Ames Research Center in California to learn about the agency's planet-hunting Kepler space telescope. Kepler scientists were on hand to discuss the instrument and its recent discovery of 1,235 potential alien planets (Kepler's tally now stands at more than 2,300 candidate exoplanets). And in July, 150 Twitter followers attended the last launch of NASA's storied space shuttle program. 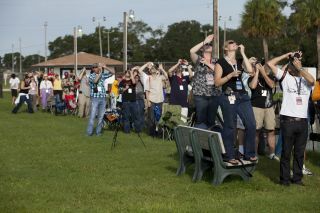 The tweeps talked to astronauts, engineers and the Sesame Street muppet Elmo before watching the shuttle Atlantis streak into the Florida sky. Tweetups allow NASA to generate social-media buzz, helping the space agency get its messages out without relying completely on print, TV or online journalists. "The goal of NASA Tweetups is to allow people who regularly interact with each other via Twitter to meet in person and discuss one of their favorite subjects: NASA," officials write on NASA's website. The space agency's social media efforts have not gone unnoticed. This year, NASA's Social Media Team won the Douglas S. Morrow Public Outreach Award for outstanding contributions to the public awareness of space exploration. The award, which is given annually by the nonprofit Space Foundation, will be presented in April at the 28th National Space Symposium in Colorado. While NASA's budget for fiscal year 2013 — which begins Oct. 1, 2012, and runs through Sept. 30, 2013 — hasn't been officially released yet, its broad outlines have already leaked out. Various sources reveal that President Obama is proposing to keep NASA's overall funding flat, allocating about $17.7 billion in fiscal 2013 compared to $17.8 billion in the current year. These numbers represent about 0.5 percent of the total federal budget. However, NASA's planetary science program is likely to take a major hit. This branch of the space agency, which works to send robotic explorers to Mars and other solar system bodies, will reportedly get just $1.2 billion next year — a 20 percent cut from the $1.5 billion it got last year. This reduction will likely force NASA to bow out of two Mars missions it had been developing with the European Space Agency, experts say. The ESA-led ExoMars missions aim to launch an orbiter and a drill-toting rover to the Red Planet in 2016 and 2018, respectively. NASA was due to provide rockets and various instrumentation for the two missions, but it will now probably withdraw completely. ESA officials have already begun talking to Russia about picking up NASA's ExoMars slack, according to media reports.